If you and your family are struggling to care for an aging loved one with Alzheimer’s, dementia, or another degenerative cognitive disease, you’re not alone. In fact, it’s estimated that over 747,000 Canadians are living with Alzheimer’s. And as more and more seniors choose to age in place, remaining in their own homes for longer, families struggle to provide the right kind of care and support to loved ones suffering from these diseases. At Senior Homecare by Angels, our Alzheimer’s home care programming is specialized so that it can make a difference in the quality of life of your loved one. And while many general home care services can help those with Alzheimer’s or dementia (like medication reminders and assistance around the home), providing care that focuses on the specific needs of Alzheimer’s and dementia patients can help improve the overall physical, mental, and emotional health of your loved one. Working to improve the security of your loved one’s home. Clients with Alzheimer’s, dementia, and other cognitive diseases often struggle with basic home upkeep and home security. Our caregivers can work with you and your family to determine what solutions will help your loved one, and then work with your loved one to establish and reinforce good daily habits around the home. Implementing a daily schedule. It’s been proven that one of the most effective ways for Alzheimer’s patients to feel safe and comfortable is to have a regular daily routine, and to avoid disruptions. Our caregivers will work with you to set a daily routine for meals, personal care, hobbies, socializing, and more that is easy to maintain and meets your loved one’s daily needs. Regular orienting. For clients with Alzheimer’s or dementia, some of the facts that ground our sense of reality can get distorted, such as time, season, weather, year, and location. Our Alzheimer’s home care providers can help provide daily check-ins that assist clients in feeling oriented, which increases feelings of comfort and security. Simplifying the home environment. Especially as Alzheimer’s or dementia diagnoses become advanced, clients often feel confusion when confronted by objects or people they don’t recognize. Simplifying the home environment can help keep your loved one happier for longer. This might include reducing clutter, storing items not frequently used, or changing daily housekeeping routines to reduce the number of items needed throughout the routine. Above all, our Alzheimer’s home care providers maintain patience, calm, and candor throughout your loved one’s care program to help them maintain dignity, agency, and safety. If you and your family are struggling to care for a loved one with an Alzheimer’s or dementia diagnosis, Senior Homecare by Angels can help. 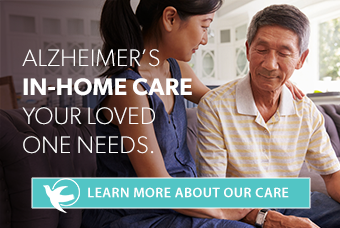 Contact the agency near you today to learn more about our Alzheimer’s home care.